I enjoyed reading the Activities sections on the book. They are well thought out. Also, the number and size of the chapters seems perfect to absorb and I imagine easy for kids to remember. Loved the Kaagey that conveys the messages !! 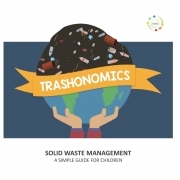 'Trashonomics' - a simple guide for Solid Waste Management, is a well researched, superbly illustrated, and informative book, that parents and teachers can use to instruct their wards on the importance of taking responsibility for one's own waste. SWMRT has done a fantastic job of getting the facts across, while keeping the reader's interest. Although the book is written for children, it's a great resource to educate adults too. 'Transhonomics' is a must-have in every school's curriculum! I plan to buy a couple dozen more to give to children in my neighborhood. It would be wonderful to have the book translated into regional languages, so the message can spread far and wide. The ease of ordering online, and the printing quality is excellent. I highly recommend this little book which is sure to have a big impact! A need of the hour book for our younger generation. Simple,attractive and informative content presented in a enjoyable manner for easy understanding . Facts and data pertaining to daily life helps connect the reader to practical implementation. A total 5 star value addition book for any school curriculum. A brilliant book. A must read for all kids in Bangalore and similar cities. The book is nicely structured, starting from the description of the problem gripping the city - black spots, burning of waste to explaining the solution. And given the solution is in many parts - the mantra of Reduce/Reuse/Recycle is driven in an easily understandable language for kids to follow. Given this comes from folks in the SWMRT, there was never a doubt about the depth of content, but more importantly the book doesnt lose focus on the target audience - kids. The fonts used and illustrations are just spot on and extremely engaging. Hats off to the authors and illustrators - I'd recommend this book to all - kids and their parents alike.